The next stuttgartnacht will be on 20th october 2018. 1. How much is the ticket? Tickets cost € 18,-, regardless if bought in advance or on the evening of the event. For children under the age of 12 the ticket is free of charge, as well as for one person accompanying a handicapped person. Please keep your handicapped ID ready. 2. Where can I buy the ticket in advance? Tickets are available in advance at the participating venues as well as all ticket booths in Stuttgart and the entire region. Ticket-Hotline: 0711/601 54 44 and online. 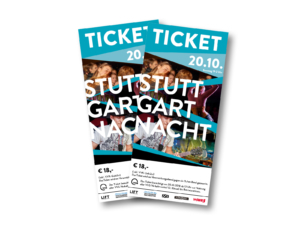 Tickets are also available in the evening at every culture institution that takes part at the stuttgartnacht. 3. What does the ticket include? The ticket is your entry into all participating venues and also functions as a VVS combined ticket for the entire VVS network. With the VVS combined ticket visitors can reach all participating venues all night long flexibly including arrival and departure. On October 20th starting at 12 p.m., the holder is entitled to use all VVS operated public transportation (2nd class) within the entire VVS network until closing hour. Besides the VVS combined ticket, Visitors of the stuttgartnacht can use the bikes of RegioRad on October 20th between 7 p.m. and 2 a.m. for free for the first time. To use the bikes of RegioRad for free, just register on www.regioradstuttgart.de (from 3€/year). Subsequently you can borrow a bike via the RegioRad-App on your mobile phone. The new Pedelecs can be borrowed for free for 30 minutes. 4. Where can I get tickets in the evening? Ticket-Bracelets for € 18,- are sold at all participating venues in the evening. Tickets bought in advance will be replaced by a Ticket-Bracelet at the first participating institution visited. Over 60 selected theatres, live clubs, cinemas, churches and more intriguing places participate in the stuttgartnacht. Here you find an overview of all the venues. 6. How long do the venues’ program run? Some cultural institutions offer program until 12 a.m., while others are open till 2 a.m. Venues that offer program after 12 a.m. are tagged as „Spätschicht“. All clubs and venues that offer program after 12 a.m. are tagged as SPÄTSCHICHT. For more information. 8. How are the cultural institutions connected? With the VVS combined ticket visitors can reach all participating venues all night long, including arrival and departure. On October 20th starting at 12 p.m. you are entitled to use your combined ticket on all VVS operated public transportation (2nd class) within the entire VVS network until closing hour. You can find the VVS-timetable in our dowload-section. 9. How long is the VVS-ticket valid? On October 20th starting at 12.00 p.m. you can use your ticket on all VVS operated public transportation (2nd class) within the entire VVS network until closing hour. 10. Where can I get the program-magazine with the entire program? The program-magazine can be found at all participating institutions and most ticket booths in Stuttgart and the entire region. You can also download the booklet from our website. For any questions concerning the event you can find us at the market place in front of the town hall on Oct. 20th from 6 p.m. onwards. 12. Is admission to all events possible at all times? Sometimes admission is not possible during the duration of a performance. This is marked in the program-magazine. Due to strong demand admission to some performances may not be possible. In advance we thank you for your understanding. 13. Will there be bag-checks? In the Rathaus Stuttgart and in the Landtag Baden-Württemberg there will be bag-checks at the stuttgartnacht on 20th October. In the Landtag bags sized A4 and bigger must be deposited at the baggage control. 14. Who’s hosting the „stuttgartnacht“? Since 2002 the Stuttgartnacht has been hosted by „LIFT – Das Stuttgartmagazin“. Furthermore LIFT also organizes the „Lange Nacht der Museen“ which takes place in spring. 15. What are the regulations for adolescent visitors? Please refer to the law for the protection of the youth. Unaccompanied teenagers over 16 are allowed to attend events until 12 a.m. at the latest. 16 or 17 year olds can stay longer if they’re in company of a legal guardian, be it their parents, siblings, uncle or aunt. The legal guardian has to carry a document stating their supervisory responsibilities, written and signed by the parents specifically for the event and containing their phone number under which they can be contacted that night.